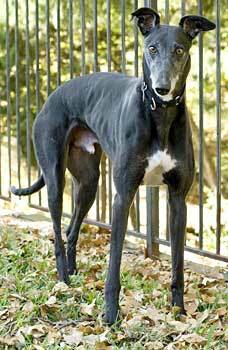 Bennet, aka Pin Oak Bennet, is a 5-year-old black male, born October 26, 2001. The son of Visa Trip and Pin Oak Abby, Bennet started his career up east. Moving through the ranks at Raynham Park in Massachusetts, Bennet become a Grade A racer. From there he raced at Wheeling Downs in West Virginia, earning his Grade AA. But like all Texans, Bennet preferred warmer winters and in November of 2005, he headed to Valley Park, outside of Harlingen. Bennet competed in his last race in February, and decided that 113 races was enough. Now ready for a home, Bennet is eager to meet his new family. Bennet will do best in a home without cats  he has a little too much interest in them. Bennet will also do best in a home without small children. 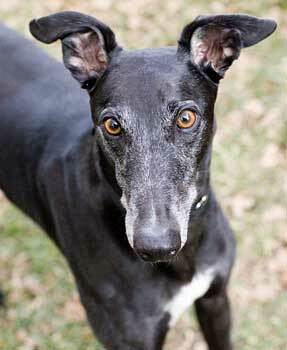 Bennet is a handsome, shiny, black boy with some white on his chest and a few of his toes. 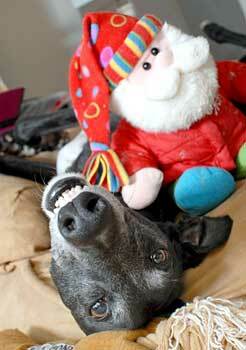 He blended right into his foster home and gets along well with his female greyhound housemate. Bennet is a fabulous foster – he's such a sweet, laid-back boy! ("Bennet" for formal occasions; "Benny" when he wants to cuddle.) He is perfectly housetrained, with no behavior issues, and the biggest cuddler you can imagine. He doesn't give kisses; he just leans in with his beautiful brown eyes and insists on being petted and hugged. One of his most endearing features is how close he wants to be to you and how much he wants to please you. He happily sleeps on his own floor pillow at night, but would love a home with a big comfy bed. Benny crates wonderfully but can be entirely trusted if you let him roam. He also just learned his first trick - "down" - and does so anytime you have a treat in hand. He knows it gets a laugh when he lays on his back with his legs in the air so he does it all the time and then watches to make sure I see him. Bennet is truly one-of-a-kind. He will make a wonderful pet for someone whether they have other dogs or not. He's a little too interested in cats and small animals, but does well with children and large dogs. He has done well living in an apartment with the occasional romp outside; however, he would also love a yard to call his own. Bennet also previously mastered using a dog door. Give Bennet a pet and hug the next time you see him - he'll be your best friend.